When Bull Spec opened for submissions in November 2009, I had no idea what to expect. Certainly not the avalanche of good stories which buried me for the better part of two years. But there’s a fine line between a good story and one of those stories that I just had to publish, and the very first of these was “Rise Up” by C.S. Fuqua. (So early in fact that this was before there was even a “magazine”, only a vague idea about publishing a story now and then.) Reading the story, listening to the music, I knew this was a story I had to have, and I’m still very proud to published it as the Mike Gallagher-illustrated cover story for Bull Spec #1. Now, the story title serves as the title for Fuqua’s recently released collection, Rise Up. Here, Fuqua explains the hardest part of putting the collection together, one I deeply sympathize with: the business side of things. So it’s no surprise after nearly three decades as a professional writer–newspaper staffer, magazine editor, and freelancer–the business of writing–manuscript marketing and book promotion–remains for me the hardest part of the process. That doesn’t mean everything else comes easily. Creative writing is work, no matter how many Joe Blows brag “I’ve got a really great idea for a novel I’m going to write as soon as I get a little extra time.” The talent for writing creatively, contrary to hot air declarations, is not developed overnight. In fact, most career writers rarely feel they’ve developed the craft fully, no matter how long they’ve been at it. But they understand and accept the devotion, self-motivation, and sacrifice of time with loved ones required in choosing writing as a career, forsaking pursuits that may offer more immediate rewards. The ability to hook publisher or agent interest in a manuscript is a mystery to me, a tall hurdle to clear, and I’m astonished with each success. After all, an author must compete with an ever-increasing number of seasoned and novice writers by summarizing a complicated plot and months, perhaps years, of work into a single paragraph that delivers everything a publisher or agent requires to say yes, even though the book/story/article is probably no better or worse than the majority of its competitors, only different. Talk about odds… Once that first sale is made, subsequent sales may become easier–Rise Up, my latest book from Mundania Press (I’m quite proud the title story appears in the debut issue of Bull Spec) may have had an easier time due to an established relationship with the publisher and the fact that most of the collection’s stories have been previously published in magazines–but the business is rarely, if ever, a cakewalk. The second hurdle comes after publication when promotional responsibilities–including those traditionally assumed by publishers–fall increasingly upon writers. Writers are now charged with securing most reviews, promoting through blog events, arranging signings and promotional events for which the writer supplies the books to sell (all once upon a time the publisher’s responsibility), purchasing and placing advertising, and more. For those who haven’t had the good fortune of hitting the bestseller lists–meaning most writers–promotional funds are usually a tad limited, crippling the ability to promote effectively. So writers must go after less costly opportunities, from the obvious free copies to reviewers in the hope of scoring a published review, to contributing to various blog events, to exposing the book to potential readers through channels such as my bimonthly newsletter, developed to promote my work and the work of other musicians and writers, regularly offering special perks such as free eBooks and music. Further, a writer must maintain a presence on social networks such as Facebook and Goodreads.com, operate an active, frequently updated website, participate in conferences, conduct workshops, and engage the press at every opportunity. For someone who shuns the personal spotlight, these activities are quite daunting, consuming precious time that could be devoted to producing new work. As for the business of writing, I crave its elimination, an impossible eventuality. Of course, I could do an Emily Dickinson, shoving my work into a drawer to languish until I’m dead and gone, but that’s simply not an option. So what’s left? For me, it’s to continue the figurative pounding on publishers’ doors, enticing reviewers, participating in an endless array of promotional activities–in other words, doing whatever it takes to get my work into the hands of readers. And though the business is the hardest part, I refuse to cave in desperation and defeat. I love the act of writing and the engagement of readers too much to give up. C.S. Fuqua’s second collection of short fiction, Rise Up, has just been released by Mundania Press and is available in paper and eBook formats at http://mundania.com/book.php?title=Rise+Up. The book collects two dozen short stories, featuring ghosts and faeries, the macabre and mundane, rich and poor, distraught and jubilant. 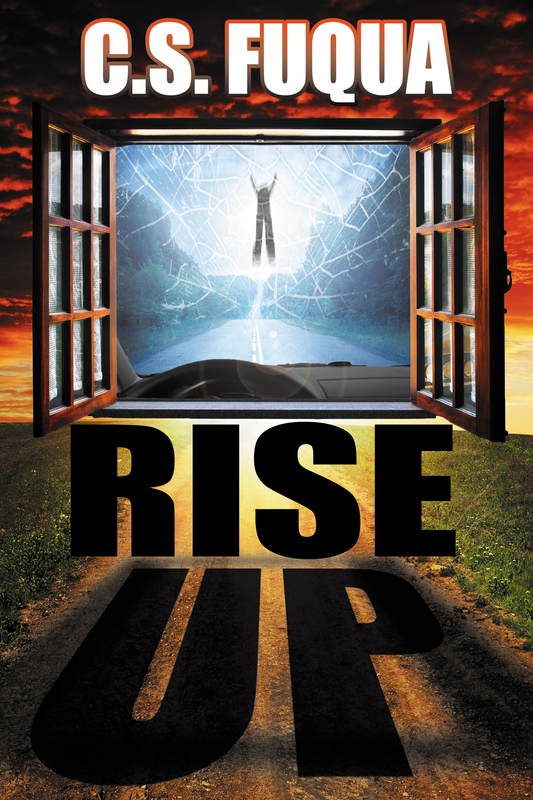 From the dark fantasy of title story, “Rise Up,” to the science fiction comedy of “The Garbler,” to the satire of “Big Daddy’s Fast-Past Gadget,” each story in Rise Up explores the motivations, actions, and consequences that force ordinary people to become extraordinary. Rise Up‘s stories intertwine good and evil and how we waver between condemnation and redemption: the cold-hearted abuse of science for battlefield enhancement in “All the Brave Soldiers,” the pity of a young girl’s ghost for a dying general in “Grace,” modern society’s propensity for foolish restrictions in “The Addict.” The title story, “Rise Up,” explores second chances when a mandolin player uses music to resurrect his fiancée following her tragic death, only to bear even greater tragedy and loss in the long run. In “Demons,” an Iraqi War veteran suffering PTSD mines the depths of compassion when he befriends a phooka, tortured and starved to the brink of insanity. From the man who spares children from life’s heartaches, to the mechanic who grossly overcharges clients for unneeded repairs, to the politicians who deceive countries into war to torture and maim in the name of a plethora of gods, evil comes in many guises. Sometimes we recognize its approach; sometimes we don’t. The stories in Rise Up explore the consequences. C.S. Fuqua’s books include Rise Up, Big Daddy’s Gadgets, If I Were… (children’s poems), Alabama Musicians: Musical Heritage from the Heart of Dixie, Trust Walk, The Swing: Poems of Fatherhood, and Notes to My Becca, among others. His work has appeared in publications as diverse as The Christian Science Monitor, Naval History, Main Street Rag, and Year’s Best Horror Stories. Please visit http://csfuqua.comxa.com. This entry was posted in The Hardest Part and tagged cs fuqua, the hardest part. Bookmark the permalink.